The Short Version: Free Dating America is liberating daters in the US from fee-based, complicated online dating platforms. The site’s unique, zero-cost service links singles across the country with a new version of an old classic: the chat room. Here, singles can meet, mingle, and increase their odds of finding a match by searching location-specific profiles or visiting an interest-based chat room like Asian, Senior, Christian, Single Parent, or Casual Dating. With easy-to-use features and a low-stress environment, Free Dating America makes meeting someone online more efficient and fun. And, for those needing to brush up on dating best practices, its blog covers a breadth of subjects and presents realistic strategies on how to make meaningful connections online. Of the 54 million singles in the United States, 49 million have tried online dating. If you’re looking for love in the modern world, odds are pretty good that you’ve turned to the web. But, with almost 8,000 sites out there, odds are also pretty good that you might’ve turned to the wrong site. According to the Journal of Psychological Science, one of the major reasons a dating site fails to find users compatible matches is because it’s capturing the wrong type of data. That is, the algorithm being employed looks at data before couples have met, completely ignoring the dynamic of how matches might interact and communicate after the initial message. That’s why a number of online daters in the US are moving away from these complicated and expensive services and are reverting to an easier way of finding love on the web: Free Dating America. The site has brought back the simplicity of the chat room and modernized it to suit today’s singles. Thousands of singles across the United States are connecting through Free Dating America. Free Dating America’s cost- and gimmick-free service removes the inaccuracies of algorithms and lets daters connect in a place where they’re sure to meet like-minded matches. The site allows users to search for other singles by location and also by interest, including Asian, Senior, Christian, Single Parent, and Casual Dating. Once you see someone you’d like to get to know more about, Free Dating America’s live chat can instantly connect you — fostering conversation and determining if you’re right for each other. There are enough obstacles on the way to love, and money shouldn’t be one of them. Free Dating America’s primary mission is to allow daters to make connections on their own terms, getting rid of the costs and messy results often associated with algorithms. The process is simple. Daters can peruse profiles based on geography and category until they see someone they like. Then all that’s left to do is send the person an invitation to chat and see if the sparks fly. Free Dating America steps out of the way and lets daters communicate and bond on their own terms. One of the main draws of Free Dating America is the site doesn’t require credit card information. As a result, members don’t have to worry about a monthly membership fee or the security of their financial data. The site also protects your personal data (and your heart) by proactively examining each new profile thoroughly. This way, online crooks and schemers won’t be part of your dating pool. Free Dating America’s goal is to keep you safe, and members are encouraged to report suspicious behavior. It’s all about creating a fun, relaxed environment to meet someone who jibes with you, and Free Dating America delivers. In the late 1990s, chat rooms were a fun way to meet others and see if you could make a connection. After 20 years of new dating technology, Free Dating America is going a bit vintage with a new spin on the chat room. 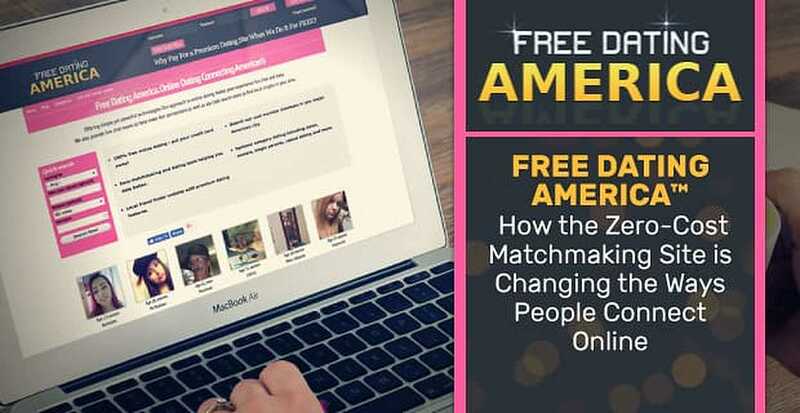 When you pop into a Free Dating America chat room, you’re engaging with more than one person at a time, which increases your chances of finding a connection. It’s a great place to meet people from different locations and who have varying interests. A chat room also helps shy people build confidence because it removes the pressure of one-on-one conversation. On Free Dating America, once you’ve found someone who catches your eye, send an invitation to chat in real time. Another great benefit of chat rooms is they offer a safe and welcoming place for those who aren’t sure if they’re ready to start online dating full-force. Rather than pursue a date immediately, singles can just talk to people to gauge their personal interest in whether to take the next step. Though chat rooms were popular decades ago, they had to be accessed from bulky desktops. But, in today’s heavily mobile world, daters can chat away and get to know new people from an array of devices wherever they go. Free Dating America leverages modern technology and allows greater flexibility in how daters communicate with one another online. Free Dating America believes online dating shouldn’t be a one-size-fits-all approach, so the site offers a selection of categories designed to help you meet someone who aligns with your personal preferences, including Asian, Christian, Casual Dating, Senior, and Single Parent. These categories allow users to search members and chat rooms that interest them most. So, for example, if you’re over 65, you can browse the Senior section for profiles of people within your preferred age range. After you see someone you might like, you can then strike up a conversation via chat. Free Dating America offers a range of categories members can use to find a match right for them. Or maybe you’re a single parent. No one understands the unique demands of juggling childrearing and dating quite like someone who’s going through the same thing. In the Single Parent chat room, you can meet those on the same wavelength and discuss the perils of all-weekend soccer matches. In terms of Casual Dating, don’t make the mistake of thinking it’s strictly for hookups. Casual Dating can include everything from attraction-based meetups to those who are just trying online dating to gauge how interested they’re in diving all in. Free Dating America makes sure this category remains on the up-and-up by requesting that users keep their messages respectful. Free Dating America not only offers an amazing dating service; the site also provides dating advice and information on its blog — with resources meant for everyone. For example, the article “How to Get Back in the Dating Game After a Long-Term Relationship” talks about common pitfalls people experience when rejoining the dating masses — such as pickiness, rebounding, and how to know if you’re ready to date again. “Online Dating Tips for Super Busy People” is a valuable guide for making the most of your dating time. It includes advice on how to target the go-to sites and set time aside for dating, including managing communication and future dates. Dating should be an enjoyable activity, not something with a cost barrier and a sci-fi level of profiling and algorithms. With Free Dating America, you get a simple interface, a way to connect quickly with others on any mobile device, and quality advice and information to make dating enjoyable and rewarding.